Galvanized steel walls are sealed on both sides. Quadra-Fold wall system and bolting pattern provide maximum wall joint strength. Backyard Leisure Pools Pretium 30′ round 52″ deep all steel pool with 6″ top ledge. Top ledge and the 5-1/4″ uprights are protectively treated and them overed with Texture-Kote. 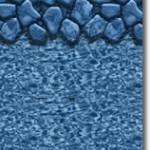 This process ensure long-lasting; all-weather protection with resistance to corrosion; scratching and damaging UV rays. Galvanized steel walls are sealed on both sides. Quadra-Fold wall system and bolting pattern provide maximum wall joint strength. Walls are corrugated for increased strength and resistance to ice and impact damage. Not for inground or partial inground installation. 30 year warranty; 1 year full. 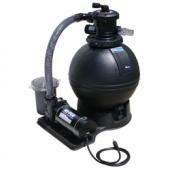 The ‘Lil Shark™ devours both large and small debris in your pool at this great price. 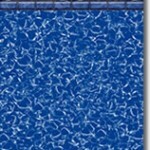 The patented vortex design, with only one moving part, even operates on pools with lower flow rates. 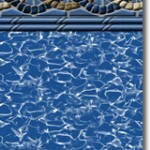 It will clean flat bottom or dished out pools, but is not a wall climber. Since it only has on moving part, maintenance is reduced and reliability is increased. The unit installs in minutes without special tools or fittings. Since it operates on the suction produced by your pump and filter system, it runs automatically whenever your pump is operating. 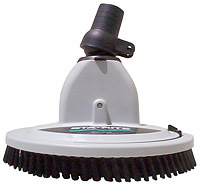 ‘Lil Shark™ not only vacuums, but scrubs your pool, gobbling up all types of debris. The unit comes complete with 32-feet of hose. Backed by a 2-Year Warranty. Invest in the debris-eating dynamo at this great price! The Confer 7100X Evolution A-Frame Flip Up Pool Ladder for Above Ground Swimming Pools features all of the durability and safety features you would find in much more expensive A-Frame pool ladders. 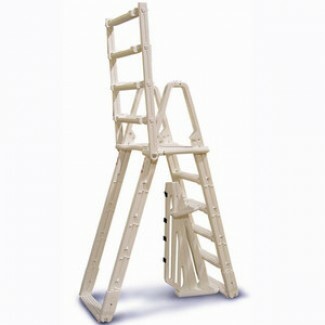 This strong ladder is manufactured with maintenance free resin and features a wide non-skid platform and extra deep 5 inch treads for secure footing. The included child-proof barrier underneath the ladder prevents entrapment while the outside portion flips up and locks to prevent unwanted entry into the pool. 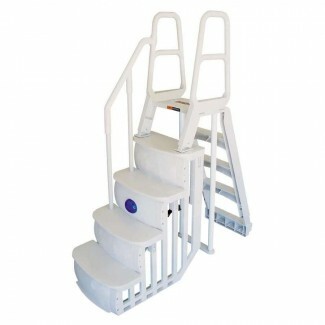 The Main Access Smart Step Pool Entry System is an innovative and comfortable entry and exit for the above-ground pool. 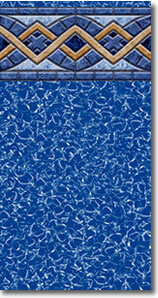 The inside 24-inch width step provides ample room for a smooth transition while maximizing the swim area. On the outside of the pool, a heavy-duty structural grade ladder offers solid footing and a swing up and lift-and-lock safety feature. The superior strength-to-weight performance, stability and price point make this combo the leader among the above-ground swimming pool step systems. 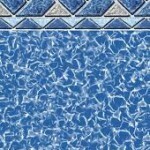 Backyard Leisure Pools Sunray 15′ round 48″ deep all steel pool with 3″ top ledge. Pearl walls match the pearl frame for a simple and classy look. 3″ steel uprights and ledge are coated with Texture Kote. All metal components vigorously coated for corrosion protection. Not for inground or partial inground installation. 15 Year Warranty; 1 year full. Pearl walls match the pearl frame for a simple and classy look. 3″ steel uprights and ledge are coated with Texture Kote. Pearl walls match the pearl frame for a simple and classy look. 3″ steel uprights and ledge are coated with Texture Kote. All metal components vigorously coated for corrosion protection. Not for inground or partial inground installation. 15 Year Warranty; 1 year full.